Since 1971, NSSI has been helping manage and treat hazardous waste, radioactive materials and mixed waste for organizations of all sizes in all industries, government and academia. We understand the importance of providing timely & concise service. Our operating procedures revolve around expediting every step of the process while adhering to the highest standards of safety and compliance. Click on the buttons below for more detailed information on each service area. The application of radioactive tracers and sealed sources in industry is as diverse as industry itself. Radioisotopes allow the tracing of subsurface fluid and gas flow, chemical plant processes, abrasion, corrosion, location of buried pipelines and line stoppage, as well as the measurement of variations in density and chemical content. NSSI provides knowledgeable and experienced staff to plan, execute, and evaluate all phases of field service projects and insure that they are conducted safely and in compliance within the NSSI license(s) and that they provide the information desired by the customer as outlined in the Statement of Work. NSSI provides specialized equipment and trained and knowledgeable staff for decontamination of equipment and facilities contaminated with radioactive materials during the use of radioactive materials or as a result of a radioactive spill. Immediate service for all decontamination procedures is provided by an experienced health physics staff to perform the actual cleanup and to advise the customer on possible legal implications and on the handling of public statements. Specialized decontamination areas are maintained at the NSSI facility for the decontamination of equipment. High pressure washing, steam cleaning, and other specialized technologies are available to address unusual contamination problems. NSSI's experience with waste and waste disposal assures that all decontamination residues are acceptable for disposal at permitted land disposal sites and treatment facilities. NSSI offers a complete consulting service to fit the needs of users of radioactive materials, radiation producing equipment, and hazardous chemicals. The consulting services include, but are not limited to, permit and license assistance, radioactive or chemical handling procedures, facility design, transportation, compliance issues, expert witness, etc. NSSI maintains multiple radioactive material licenses and a part B hazardous permit and NSSI personnel remain abreast of the latest regulations and requirements in both areas through ongoing training and education. NSSI provides assistance with documentation, record keeping, and permitting for facilities that wish to utilize third party evaluations of their health and safety programs and assistance with compliance issues. For smaller companies that may not have adequate staff to justify the expense of specific compliance personnel, NSSI can provide competent and experienced personnel and documentation to assure the safe operation of the facility and aid management in insuring that their facility meets all regulatory compliance limits. NSSI's permits to accept and treat radioactive, mixed, and hazardous waste materials allow NSSI to provide waste treatability studies to determine the chemical and mechanical treatments necessary to convert a waste to a form suitable for final disposal. On-site permitted units allow treatability studies for any waste volume. NSSI provides instrument calibration services for radiation survey and monitoring instrumentation. NSSI maintains a full spectrum of alpha, beta, gamma, and neutron calibration sources traceable to the National Bureau of Standards. Source activities range from microCurie to multiple Curie. NSSI performs innovative research programs on the recovery and recycling of tritium. The research led to the development of robust and scalable processes for the segregation of tritium from mixed waste, metals, capture beds and water. NSSI provides training in all areas of radiation and hazardous chemical handling. Training programs are specifically designed to meet individual customer requirements. Training can be provided at customer sites or at the NSSI facility. NSSI has collected, compacted, treated, and shipped radioactive waste to offsite facilities for disposal since 1971 and is permitted for a full spectrum of radionuclide including special nuclear material (SNM). For sealed radioactive sources, NSSI can provide the design and fabrication of specialized containers for land disposal and accepts sealed sources for consolidation and packaging for land disposal. As needed, NSSI provides personnel and equipment to aid in the packaging and transport of radioactive waste materials at customer sites. NSSI accepts a full spectrum of hazardous and radioactive waste materials for on-site treatment and off-site final disposal. NSSI treats solids, liquids, and gases bearing EPA hazardous waste codes as well as non-hazardous and accepts many specialized chemical wastes such as Mercury and Freon for recycling and reuse. NSSI can provide full hazardous waste services including on-site lab packing and labeling, transport, treatment, and final disposal. NSSI provides for the treatment and disposal of organic and aqueous chemical waste materials at competitive pricing. While fuel blenders are limited in their selection of wastes for "fuel" blending to a minimum of 5,000 BTU per pound so that, when blended for burning as "fuel", the final waste will provide not less than 8,000 BTU per pound. All NSSI blended wastes are sent to commercial facilities permitted for "incineration" rather than for burning as "fuel". As a result, the "fuel" BTU restriction does not limit the types of solvent and water wastes NSSI accepts for waste blending. NSSI can therefore provide for the blending and incineration of liquid organic solvents and aqueous streams at very competitive pricing. NSSI allows up to 50% water by weight and does not require that received waste streams meet any minimum BTU content. Aqueous wastes exceeding 50% water content by weight are acceptable with excess water surcharges. Halogen content is not a cost factor below 5% halogen (non-fluorinated) and halogen wastes, including fluorinated wastes, are accepted up to 100% with appropriate surcharges. The solids content of liquid waste is also factors into pricing. With the solids content measured as suspended solids and settled solids. Settled solids are determined by measuring the depth of the solids. Suspended solids are measured by centrifuging a representative sample of the liquid layer. The metals content of liquid waste streams is very important as any metals contained may become an ingredient of the incineration facility's solid, liquid, or gaseous effluent and significantly impact costs and/or eligibility. 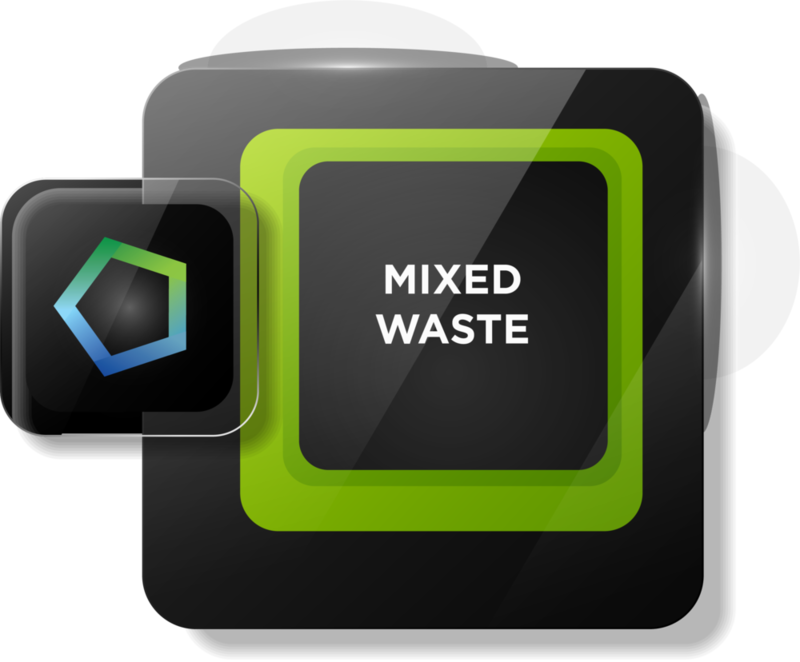 To assure that wastes received are in fact the wastes quoted, NSSI requires that a generator complete a waste profile defining all of the parameters of their waste and to support the profile with analytical results or knowledge of the process generating the waste. NSSI compares the received waste to the generator prepared profile. NSSI has long specialized in the treatment of hazardous compressed gases. NSSI uses a variety of chemical processes to react the gases to form non-hazardous treatment residues. NSSI accepts a full spectrum of compressed gases including those with radioactive constituents. NSSI is permitted for the acceptance of wastes containing both radioactive and hazardous constituents referred to as mixed wastes. Mixed wastes are treated at the NSSI facility to separate the radionuclide from the hazardous component or to treat the hazardous component so that the waste is no longer hazardous. Such separation or destruction, in most cases, will allow the individual components to be disposed as radioactive waste or hazardous wastes at offsite facilities permitted for final disposal. The disposal of Nickel 63 and Tritium foils and the devices containing these foils is increasingly difficult due to limitations on the disposal of foils at land disposal sites. Land disposal site acceptance criteria limit the millicurie content per volume or per mass for each radionuclide contained in the waste. In addition, land disposal sites charge a per millicurie surcharge for each millicurie contained in the waste and disposal of used foils and devices containing foils often costs more than the cost of the replacement foil. Land disposal sites require that each generator obtain and pay for a site use permit. For those generators whose waste is to be disposed at the Richland, WA or Barnwell, SC land disposal sites, NSSI can assist with obtaining the permits and providing the necessary insurance coverage. Tritium foil generators may wish to consider using NSSI's new Tritium recovery process. After removal of the Tritium, the minimally contaminated foil is disposed as NSSI generated solid radioactive waste. Uranium, and Thorium Nitrate and a few other compounds are EPA waste coded D001 and /or D003 and must be properly treated to eliminate these codes before they are acceptable for land disposal. Land disposal sites may require that a generator or broker, who wishes to ship Uranium and Thorium compounds provide analytical data to demonstrate that the compounds do not carry EPA waste codes. NSSI provides chemical treatment, stabilization, and testing to satisfy the disposal site requirements. Uranium and Thorium containing waste materials must be properly packaged, labeled, and transported on both a Texas Uniform Waste Manifest and a radioactive waste manifest signed by the generator. Compounds with EPA waste codes must be accompanied by a Land Disposal Restriction form. Each generator must provide a current copy of their disposal site use permits to NSSI before NSSI will authorize shipment of the wastes to NSSI. NSSI also accepts and treats liquids containing dissolved Uranium and Thorium compounds and in solution with other chemicals. Charges for treatment and disposal of Uranium and Thorium compounds are based on the gross weight of the Uranium or Thorium compound and its primary container. In order to profile such wastes, the generator will be required to submit samples of the solutions to a qualified laboratory for a total TCLP metals and total Uranium analysis and to provide the analytical results with the waste profile submitted to NSSI. With these data, NSSI will be able to quote a firm treatment and disposal price. Uranyl Acetate contaminated debris is accepted and priced based on the chemical and physical constituents. Contact NSSI for assistance with profiling. Beginning in 2013 in Texas, licensing was made exempt for low-level radioactive materials used in the oil and gas exploration and production industries and these materials could be buried by the users as longs as the tracers are not water soluble, do not exceed 1000 picocuries per gram and have a half-life of less than 120 days. NSSI can provide disposal of all tracer materials that are not exempt under SECTION 336.227 Radioactive Tracers Used in the Exploration, Development or Production of Oil or Gas or Geothermal Resources. NSSI is permitted for the storage of up to 4000 drums of waste materials including wastes containing radioactive material. For long lived radioactive materials, NSSI can provide storage pending transport to a land disposal site or return to a licensed generator. For short lived radioactive material, storage can be provided for decay of the radionuclide. The short lived decayed waste is surveyed and transferred to off-site permitted disposal facilities for final disposal by incineration or land disposal. NSSI accepts a full spectrum of radionuclide sources for such consolidation and can assist generators with transport containers and transportation. As NSSI is the Department of Energy (DOE) Offsite Source Recovery Project (OSRP) consolidation facility, NSSI assists generators in transferring sources to the program as well as other permits outside the program. With special arrangements, NSSI can accept leaking sealed sources and can provide source encapsulation where special form documentation is required. NSSI provides Tritium recovery services in excess of 99% of the contained Tritium for reuse and resale as an alternative to the land disposal of high Tritium content materials at its hazardous, mixed and radioactive waste processing center. NSSI is currently accepting electron capture detectors, static devices, sealed neutron generator tubes and target assemblies with activities ranging from milliCuries to multiple Curies. Tritium is a major problem from a land disposal standpoint as Tritium exchanges readily with ground water and tends to move easily through geologic structures. Land disposal sites limit the Tritium activity of incoming wastes to 1 micro Curie per cubic centimeter unless expensive over pack containers are utilized. As a result, Tritium generators are searching for alternatives to land disposal in order to protect the environment, limit operational expenses, and avoid future liabilities associated with the remediation of sites which have Tritium mobility problems. Waste streams treatable by the Thermal Desorption System include targets from neutron generator devices, foils from electron capture detectors, static eliminators, static measurement devices, ion getter pumps, and metal components of Tritium handling systems and Tritium gas storage devices. A second generation 3" oxidizer is in operation at NSSI's Houston facility which provides oxidation services for high Tritium content organics. The technology for the oxidation of high Tritium organics was developed by various governmental laboratories and pharmaceutical research facilities to convert the residues from multiple Curie Tritium labeling activities to water and carbon dioxide. The existing system is capable of oxidizing 40 liters per day for most organics and of unattended operation. The oxidizer currently in operation has demonstrated oxidation of alcohols containing halogens with a conversion efficiency of 99.99% and quantitative recovery of the Tritium content. The system is useable for all types of liquid organics or organics suspended in liquids including halogenated organics. Water with trace organics can be processed if mixed with other organics to support the oxidation. At present this technology is limited to economic concerns as the oxidation process yields a volume of tritiated water equivalent to the volume of the oxidized organic. As a result, NSSI is restricting use of the system to organic waste streams containing greater than 1 Curie per liter. Tritium disposal is a major problem for high activity Tritium users as Tritium exchanges readily with ground water and moves easily through geologic structures. Tritium releases from incinerators, fuel blenders and other thermal treatment facilities add to this ground water contamination as the Tritium exchanges with environmental moisture and returns to the earth as precipitation. Subsurface Tritium has received significant news media attention in recent years and has sensitized governmental and commercial Tritium users to disposal methods which result in releases into the environment. NSSI's TOX oxidation process provides an alternative to environmental releases by recovering the Tritium content of waste streams for reuse or for storage for decay.